At Blue Orange Games, we can’t take all the credit for our hot games! We owe a huge debt (more than monopoly money) to our fabulous retailers who give us feedback and put energy, passion, and time into their businesses every day. 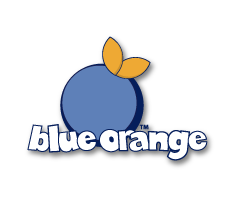 This space is dedicated to a very special retailer each month in order to highlight the stores and individuals that bring Blue Orange games from shelves into homes and that do us the honor of introducing us to families in their area. 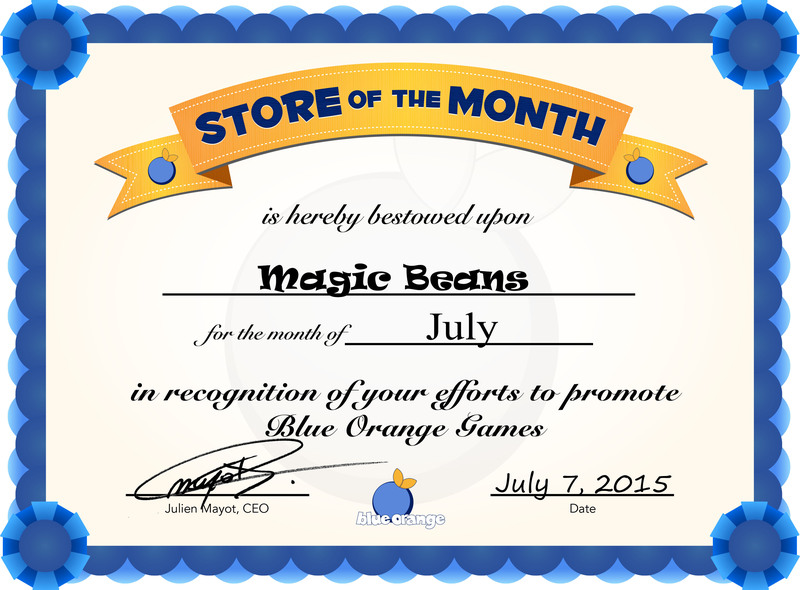 We are pleased to announce that our Retailer of the Month for July is none other than Magic Beans, located in Massachusetts! Renaud, from our sales team, nominated this retailer not only because they have been a supportive Blue Orange customer for years, but also because of their great staff and involvement with the community. He said that when he visits them to do staff training, everyone is enthusiastic to receive him and learn new games. He also cited Eli’s six Magic Bean stores as demonstrating a successful business model because they are heavily involved with the community and dedicated to helping customers. When asked about the “magic” behind his success, Eli focused largely on the importance of hiring procedures and his desire to give back locally. Using previous experience as an evaluator of private high school admission applicants, the first question Eli asks business owners having difficulty with their staff is “What’s your recruiting process?” At Magic Bean, the quality requirements for prospective staff are stringent and broad. The company spends a lot of time finding the right people to work for them, seeking engaging, smart staff that make friendly coworkers and help generate the stores’ happy environment. Beyond this, Magic Bean particularly values curiosity in its employees. With over 3,000 different products for sale, it takes a sense of discovery and a lot of initiative for an employee to pick up a new game on the shelf and figure it out so they can demo it to a customer without relying solely on their training. It is especially impressive that Magic Beans has maintained this consistency in its staff culture as it has expanded, and in the end, that has to come down to who they hire and the training they provide. As for community involvement, Magic Beans prefers grassroots efforts to reach local businesses and the larger community. They support resident children’s charities, schools, camps, and other youth organizations in the area. One of their largest outreaches, however, would be the Magic Beans baby expo “Drool,” a huge day event where new and expectant parents can learn about different brands and baby products in a single location from expert company representatives who demo everything from strollers and car seats to accessories and games. It’s a great way to get a hands-on feel for products, compare features, and ask questions. 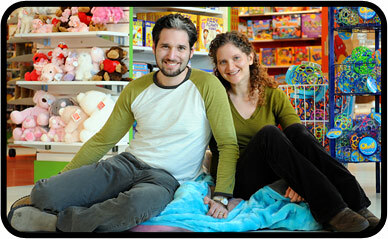 One attendee described it as “the Apple store” of baby products because of the bubbly, knowledgeable and helpful staff. For more on this event see here. Eli first got into the baby product and toys industry around a decade ago when he saw that all the toy stores in his area had closed. He then spotted an opportunity in the trend for modern baby products (“modern” meaning more specialty goods of higher quality) and wanted to provide that for his area. As for the future, he is very interested in recent technology available in the field of bio-metrics. Eli is constantly researching and perhaps a rare expert on the connection between baby products and toys and games. Every weekend you can catch Eli reading up on marketing tactics and how the shopping habits of customers have evolved since last season, so that he can understand them and serve them better. This is one of his favorite parts of the job, though if he could just sell games and strollers all day long without thinking about marketing he would be perfectly happy. This is most likely because the flip side to ever-changing customers is it never gets easier, and there is always competition. It can be very disheartening as a retailer when you try everything and nothing seems to work, especially if you, like Eli, take your employees livelihoods very seriously. The only thing to do in such times is become resilient, taking encouragement from each customer you help and with whom you create a positive interaction. Eli’s favorite toy as a child was GI Joe. He loved the aspect of make-believe in such toys, how action figures could play out whatever event he had in his imagination, and he truly thinks they don’t make toys like it anymore. For being produced in the 80’s, GI Joe excelled in quality, and was full of intricate detail and hideaway control parts that have somehow been lost in the era of cheap, out-sourced manufacturing. When his store opened, the quality of our classic wooden Gobblet pieces were not lost on him and it became his first favorite game to sell, which he had stocked not only in his store but also in his home! Since then, Eli has continued to be impressed by the wonderful innovations from the team at Blue Orange Games. Although we can’t be completely sure it’s only because of our great games that he comes to see us at Toy Fair or also because he loves to have a glass of champagne with our CEO afterwards. Either way, we couldn’t be happier to have such a quality-smart and huge-hearted retailer repping our games at six stores in Massachusetts to families who already enjoy Blue Orange games and those who haven’t discovered us yet! 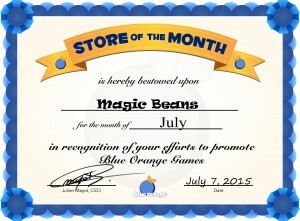 Here’s a big cheer and thank you to our friends at Magic Beans! And I’ll make it extra big because… it’s their 11th anniversary this July 7th!